As probably most of you already know, back in may 2014 we released a standalone free CTR tool. 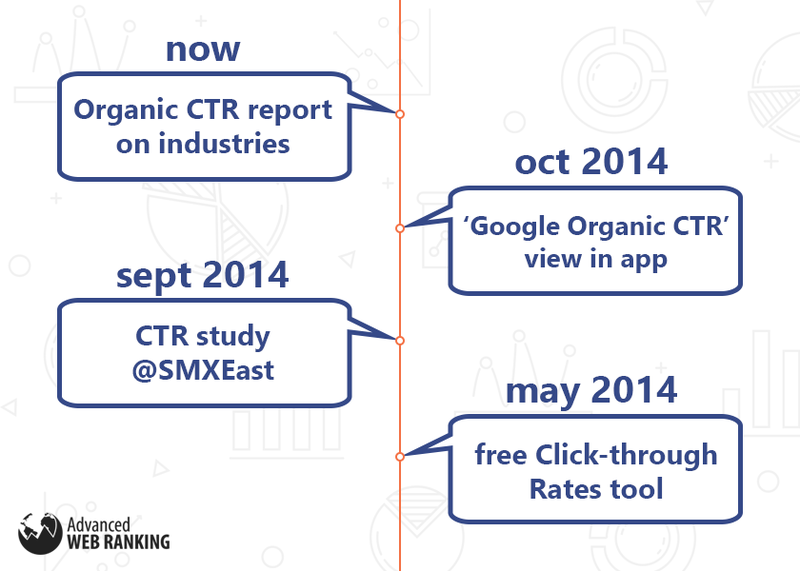 A few months later, based on these gathered stats, we conducted a study to find out how many clicks each SERP gets. 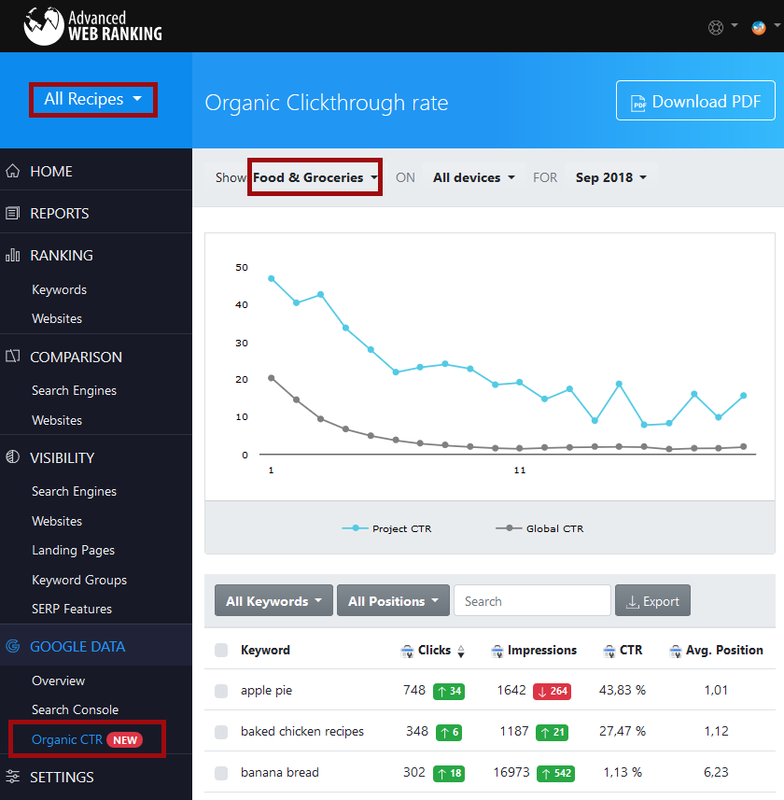 Fuelled by the success this topic received, we integrated the “Google Organic Click Through Rates” report in our app as part of the Google menu. Only think about the seasonal character some of them have, or the searchers’ behavioural differences when browsing from desktop vs. mobile devices. Furthermore, with these benchmarks in mind, it’s a lot easier and more righteous to explain clients the CTR values achieved. Tip: make sure to pair up each of your GSC accounts with its corresponding AWR project in order to get access to this data. Navigate through your projects and select their corresponding industry from the drop-down. Your project’s CTR average values for each position will be displayed next to the industry ones in the same chart. This way, you can spot at glance where your attention is being required. Furthermore, you can easily split the data by device and / or by month, depending on your interests. Tip: Even when graphs are pretty close, it would be advisable to further investigate since some of your keywords are branded terms, which usually have a higher CTR and influence the overall average. Once you’ve spotted the underperforming projects, it’s time to narrow your analysis down to keyword level. 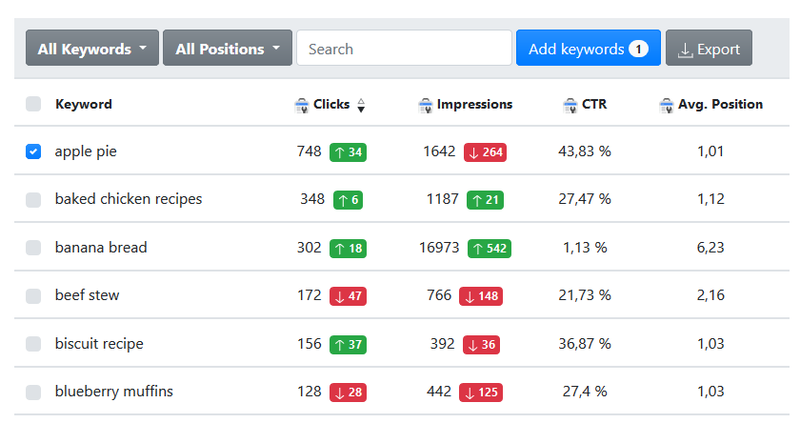 Comparing each keyword’s CTR value from the table with the industry’s averages for each position will show you exactly where to focus your efforts on. Tip: Focus on a certain position at a time by using the “All Positions” drop-down. This is especially advisable when dealing with large amounts of keywords. Some keywords have a higher growth potential than other which translates into higher traffic, and, of course, higher ROI. Such as, for example, keywords in top 3, with more than 20.000 impressions and with a clickthrough rate below the industry’s average. To spot them, simply export the data to CSV and apply custom filters and formulas on it. Tip: export the values for different months and merge the data to track your CTR evolution in time. Now since you’ve compared your keywords’ CTR against the industry’s average values, each of them will definitely fall in one of these 2 categories: above the average or below it. Therefore, a good starting point when finding out why some of your keywords have a below-the-average CTR would be to have a closer look at how the SERP shapes up for each case. There might be some feature snippets above your entry that influence your CTR and the best way check this hypothesis would be by using the SERP Features Visibility report. So how about you? How do you report CTR values? Individually for each industry or based on a different criteria? And, of course, how do you discover low-hanging fruit keywords? Please make sure to let us know your thoughts, questions and feedback. And I’ll see you soon with more updates! I read this article and it is very useful. It gave me some good insights about the new report. I specially like the way you explain everything in just couple of lines. Thanks for sharing the information. Congratulation for sharing a great article on CTR! Thank you for sharing this information. It was really great. Thanks for sharing, it’s great. You’re right we should focus on the keywords with a higher CTR than average. I make sure it for my next post. I specially like the way you explain everything in just couple of lines. Thanks for sharing this article.